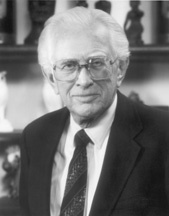 METZENBAUM, Howard Morton, a Senator from Ohio; born in Cleveland, Cuyahoga County, Ohio, June 4, 1917; graduated, Ohio State University, Columbus 1939; graduated, Ohio State University School of Law 1941; admitted to the Ohio bar in 1941 and commenced practice in Cleveland; member, Ohio house of representatives 1943-1947; member, Ohio senate 1947-1951; campaign manager for United States Senator Stephen M. Young 1958, 1964; unsuccessful Democratic candidate for the United States Senate 1970; chairman of a group of suburban weeklies in the Cleveland area; appointed by the Governor, January 4, 1974, as a Democrat to the United States Senate to fill the vacancy caused by the resignation of William B. Saxbe and served from January 4, 1974, until his resignation December 23, 1974; unsuccessful candidate for renomination in 1974; resumed the practice of law; elected on November 2, 1976, to the United States Senate for the term commencing January 3, 1977; subsequently appointed by the Governor, December 29, 1976, to fill the vacancy caused by the resignation of Robert Taft, Jr. for the term ending January 3, 1983; reelected in 1982 and 1988 and served from December 29, 1976, to January 3, 1995; was not a candidate for reelection in 1994; chairman, Consumer Federation of America (1995-2008); died in Aventura, Florida, on March 12, 2008; interment in Mayfield Cemetery, Cleveland Heights, Ohio. Patterson, Samuel C., and Thomas W. Kephart. The Case of the Wayfaring Challenger: The 1988 Senate Election in Ohio. Congress & the Presidency 18 (Autumn 1991): 105-20.